Suits are undeniably one of the most common and elegant outfits for men that know how to wear them correctly. Unfortunately, most men don’t know how to make the best of wearing a suit and are often spotted making mistakes like wearing over-sized suit jackets and pants, wearing odd colored ties and so on. Before buying a ready made suit, make sure it is your size and avoid wearing one that’s loose fitting. If you can’t find a suit that fits you perfectly, then have a tailor sow one for you. In this case, make sure the tailor is reputable, to avoid messing up your suit and wasting your money too. Always wear your suit with quality shirts that matches or provides a nice contrast with the suit in terms of color, and style. If you have a black suit, go with a shirt color like white or sky blue. Your shirt collar must always be exposed about 0.6 cm above the suit collar. If your suit collar is too big, your shirt collar won’t show. So when buying or sowing a suit, make sure the collar fits perfectly well. Check your suit trousers and see if they're resting on your shoes or about to swallow your shoes. Ensure it is resting a bit on your shoes, otherwise have a tailor reduce their length. Have your suit jacket sleeves measured so that about 1.3 cm of your shirt is exposed. If you have a suit with long jacket sleeves, have them reduced by your tailor. The color of your suit should always match that of your socks. You can’t match a grey colored suit with purple-colored socks; it’s not a befitting match. Grey-colored white or black socks would be much more appropriate. Make sure your belt, shoes and watch match your suit in-terms of color and quality. When wearing a black suit, match it with a black belt, black shoes and a black watch. Don’t neglect the beautifying power of these little accessories because as far as wearing a suit is concerned, they matter too. Look for an appropriate tie and use either the standard or Windsor knot. Most importantly, make sure that your neck tie is long enough to touch your belt buckle, but not so long that it covers it. 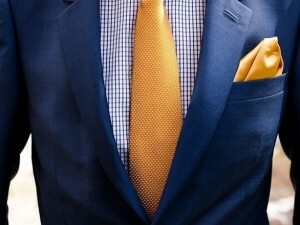 Have a pocket square rightly fitted in such as way that it peeks out the top of your jacket pocket. Also, the color of the pocket square should match that of the neck tie always. It is one thing to wear a suit and it is another thing to look extremely good in it. You can use these simple tips to improve your suit-game and help you look stunning whenever you wear one.